Trump spoke Wednesday at an emergency management center in the city of Conway, near Myrtle Beach. South Carolina Gov. Henry McMaster said during the same briefing that “the worst is yet to come” for his state. Both Carolinas are grappling with the effects of severe flooding, with more flooding expected as rivers crest. President Donald Trump is getting an update on how South Carolina is recovering from Hurricane Florence. Trump was participating in a briefing Wednesday with South Carolina Gov. Henry McMaster, Republican Sens. Lindsey Graham and Tim Scott and other officials. Television screens on the walls at the county emergency management center in Conway, South Carolina, showed scenes of flood damage from around the state. Officials say Conway hasn’t seen the worst of the flooding yet. Trump surveyed flood damage earlier Wednesday in parts of North Carolina before arriving in Conway by helicopter. 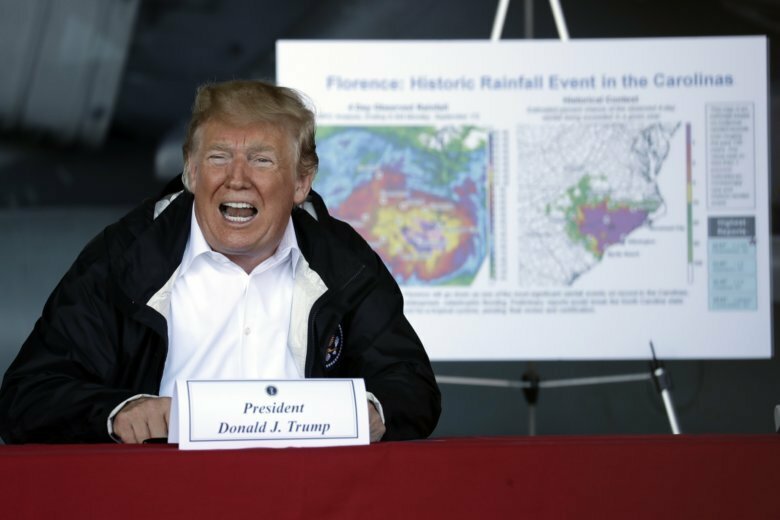 President Donald Trump has toured a South Carolina neighborhood that’s bracing itself for more severe flooding due to Florence. He told people things are “going to be OK,” and others thanked him for coming. Trump put his hands on people’s shoulders and promised that a “lot of money” will be coming from Washington. He’s also asking how people are doing as he surveys the block. As he arrived, Trump’s motorcade crossed a swollen river with busted docks and damaged boats, including one that had washed up against a hotel. New Bern’s residential streets are lined by debris, including siding and furniture, with sofa cushions and mattresses scattered about. Trees are down and piles of destroyed furniture are stacked outside houses. He’s passing out Styrofoam containers with food, including hot dogs, chips and fruit and asking how those driving through are doing. “How’s the house?” he was heard asking one person. “You take care of yourself,” he said. The president says he wants to say “hello” to everyone from the Federal Emergency Management Agency and the military that are working hard to help residents recover from the storm.